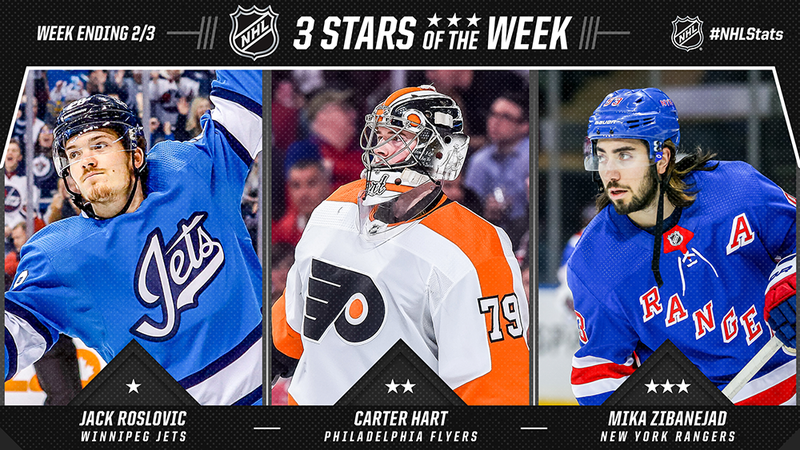 Winnipeg Jets center Jack Roslovic, Philadelphia Flyers goaltender Carter Hart and New York Rangers center Mika Zibanejad have been named the NHL’s “Three Stars” for the week ending Feb. 3. Roslovic tied for the League lead in scoring with six points (5-1—6 in 4 GP) as the Central Division-leading Jets won three of four starts to improve their overall record to 34-16-2 (70 points). He began the week by notching Winnipeg’s only goal in a 3-1 loss to the Philadelphia Flyers Jan. 28. After being held off the scoresheet in a 4-3 shootout victory over the Boston Bruins Jan. 29, Roslovic recorded one goal in a 4-3 win over the Columbus Blue Jackets Jan. 31. He finished the week by recording 3-1—4, his first career hat trick and four-point game, in a 9-3 triumph over the Anaheim Ducks Feb. 2. Selected 25th overall by Winnipeg in the 2015 NHL Draft, the 22-year-old native of Columbus, Ohio, is in his third campaign with the Jets and has posted 7-9—16 in 51 games this season. Hart went 3-0-0 with a 2.27 goals-against average and .931 save percentage to help the Flyers (23-23-6, 52 points) register a perfect 4-0-0 week and extend the NHL’s longest active winning streak to seven games. He began the week by making 31 saves in a 3-1 victory over the Winnipeg Jets on Jan. 28. On Jan. 31 he stopped 23 shots in a 3-2 overtime win over the Boston Bruins and capped the week with a career-high 40 save performance in a 5-4 overtime victory over the Edmonton Oilers on Feb. 2. In doing so, the 20-year-old native of Sherwood Park, Alta., extended his personal win streak to six games, becoming the sixth goaltender in NHL history to record a personal win streak as long before celebrating his 21st birthday and first since Montreal’s Carey Price in 2007-08 (7-0-0). Zibanejad tied for the League lead in scoring with 3-3—6 in three games, earning a point on each of the Rangers’ six tallies for the week. He was held off the scoresheet in a 1-0 loss to the Philadelphia Flyers Jan. 29 before rebounding with 3-1—4, including his second career hat trick and the game-winning goal, in a 4-3 win over the New Jersey Devils on Jan. 31. Zibanejad finished the week by recording his team-leading 13th multi-point outing of the season with two assists in a 3-2 loss to the Tampa Bay Lightning Feb. 2. The 25-year-old Huddinge, Sweden, native leads all Rangers skaters in assists and points with 20-30—50 in 51 games this season, one shy of his career-high point total set in 2015-16 (21-30—51 in 81 GP).